Charlotte Loraine Lochner (nee Gest), passed away peacefully on Friday morning, March 29th, at Good Samaritan Nursing Home in Lodi, Wisconsin. She was 90 years old. Charlotte was born on November 26th, 1928, in DeForest, Wisconsin to Arthur and S. Josephine (Rinde) Gest. She was a life-long resident of the DeForest area. Charlotte graduated from DeForest High School in 1946. She was united in marriage to Robert E. Lochner on May 26, 1951 in Waunakee. They were blessed with six children, Michael, Thomas, Joseph (deceased), Jill, Scott and Kay. Bob and Charlotte made their home in DeForest. Bob passed away unexpectedly in 1970, and Charlotte was forever grateful to her many family and friends who were a constant source of love and support as she continued to raise their family alone. Family and faith were essential to her, and she understood the power of prayer, for herself and for others. Charlotte cherished the memories of the time spent with family and friends when her children were young, and always looked forward to family holidays and get-togethers as she watched her grandchildren grow. She had a great sense of adventure and loved to travel. She enjoyed playing cards, especially euchre, and continued to do so until shortly before her death. She was a thoughtful and considerate friend, and a source of inspiration to many. Charlotte loved, and was greatly loved in return. Charlotte is preceded in death by her parents, Arthur and Josephine, her husband, Robert, her son, Joseph, and son-in-law, Mike Kelly. She is survived by her brother, John (Margaret) Gest; her sons, Michael (Ruth), Thomas and Scott (Sue); her daughters, Jill Kelly and Kay (Dan) Schmalstig; her grandchildren, Bob (Kaitlin), Anne, Katie (John) Healy, Tom, Charlie, Travis, Troy, Raye and Joe; great-grandson, James. She is also survived by many dear friends, nieces and nephews, including her very special niece Lois Ford. The family wishes to thank the nurses and CNA’s at Good Samaritan and Agrace HospiceCare for their devoted care. A special thank you also, to the residents at Good Samaritan who were both friend and family. A wink goes out to Jeannette, her “twin”, for bringing such fun and mischief to her life. 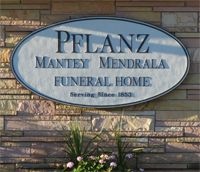 Visitation will be held at the Pflanz Mantey Mendrala Funeral Home in Portage on Friday, April 12, 2019, from 4:00 p.m. until 7:00 p.m. Funeral services will be held at 2:00 p.m. on Saturday, April 13, 2019 at St. Peter’s Lutheran Church, 303 Park St., in Arlington, with the Rev. Christopher Amen officiating. Visitation will also be held on Saturday from 1:30 p.m. until the time of the service at the church. A luncheon will be held following the service at the Arlington Community Center. Interment will take place at St. Olaf Cemetery in DeForest, following the luncheon, at 4:30 p.m. In lieu of flowers, memorials may be made to the family to distribute to Charlotte’s favorite charities.